On Friday, Fiat announced that the Environmental Protection Agency (EPA) has rated the Fiat 500e (EV) with the highest highway fuel efficiency of any electric car on the market, and to have among the longest driving range of the non-luxury electric cars. This ranks the 500e among the most energy efficient cars being manufactured, with the closest match being the Scion iQ EV. 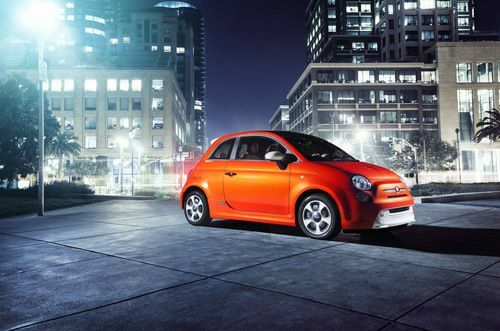 The Fiat 500e is the electric version of Fiat's stylishly subcompact 500 series. The 500e has a battery-electric powertrain that produces 111 horsepower (83 kW), and recharges at 240 volts in less than 4 hours. The fuel efficiency rating certified by the EPA is 122 MPGe city, 108 MPGe highway, and 116 MPGe combined. The driving range was certified at 87-miles. These numbers are due to the 500e consuming only 29 kilowatt hours (kWh) per 100 miles. The closest car in fuel efficiency, the 2013 Scion iQ EV, is certified for 138 MPGe city, 105 MPGe highway, and 121 MPGe combined. That car has only a 38 mile driving range, and consumes 28 kilowatt-hours/mile. All this energy efficiency means the Fiat 500e is miserly on your finances. Its annual fuel cost is only $500, a figure based on factoring electricity price projections into 15,000 miles of travel at a vehicle's combined city/highway performance rating. The Fiat 500e is due to appear in FIAT Studios in California in second-quarter 2013. The Fiat 500 series is designed to be reminiscent of the Cinquecento, and since the 2007 launch of the 500 series over 1 million of them have been sold in 100 countries worldwide.